Education – here in a state election, I’m focusing on properly funding public schools. Newly-arrived migrants can cluster in a single suburb if they wish, not learn English if its suits them and as for a strong work ethic, that’s optional too. To criticise this pattern of urban settlement is to invite a social media scream of ‘racism’. To talk about obvious issues like ‘white flight’ is to be howled down by the offenderati (as per Luke Foley’s experience inside the Labor Party). The Liberal party was worse on my key issues than I expected. I hadn’t expected to vote for them, but their entire environmental policy was to invest $22m in Landcare. Also, they promised to clear “Labor’s school maintenance backlog” which after 8 years of government is a bit much. The Animal Justice Party really is a single issue party – their educational policy, for example, involves teaching students about vegetarianism. Australia has a long history of creating new towns. We’re looking forward and building a new city between Sydney and Canberra, called Turing. Placed between Sydney and Canberra on a high-speed train line, Turing will be a place that is desirable for people who have family in either Canberra or Sydney, and may even have jobs in those cities. Anyway, definitely a worthwhile exercise, and for the Federal election, I plan to do it a bit earlier and blog about it again. Where I live, we are about to have two elections – state (NSW) and federal (Australia). So in this household we’ve been talking a lot about politics, and in particular, priorities. But this particular post came about because, in researching my local member, I came across this facebook feedback form. You can tell just by looking at the framing that this local member comes from the conservative side of politics (“securing Australia’s borders”). But it is actually a useful thought starter. If you can only pick four, what are your top four issues? And what do you want done about them? I’m a big fan of forced prioritisation. So I gave it a go. This list is for the Federal (Australian) election. Despite the state election being first, I haven’t figured out my priorities there, although they aren’t actually all that different. Climate change – Take seriously that we need to reduce carbon emissions in Australia to net zero by the middle of this century. Australia is in the top 20 carbon emitting countries on the planet (not per capita – per capita we are much worse). We are also one of the richest per capita countries on the planet, and we have access to more renewable energy than most countries, if we have the political will to transform our economy to use it. Indigenous policy – add an indigenous voice to Parliament. When indigenous leaders from around Australia were asked what they wanted in response to the terrible inequality facing indigenous people in Australia, that was their request in their Statement from the Heart. While in one sense it seems symbolic, rather than practical, the practical actions taken by both sides of politics have failed over many years. It isn’t a coincidence that indigenous voices have not generally been involved in deciding on those actions. Having diverse views involved in decision making changes the framing as well as the decisions. Inequality – Inequality in Australia is increasing. That’s not just bad for people at the bottom of the spectrum. It’s bad for everyone. Increasing inequality makes the whole financial sector less stable (it’s thought to be one of the major causes of the 1930s Great Depression and the 2008 Global Financial Crisis). Newstart – the support for unemployed people – has not kept pace for inflation and is increasingly hard to live on. Our country as a whole does better when everyone has a chance to succeed – see this research from the OECD. Education – closer related to my third priority. Education in Australia is some of the least equal in the world, in terms of resources per child. As a country, we will do so much better if we educate everyone well. Plus it is an ethical issue – children’s opportunities to be educated shouldn’t depend on their parents wealth and location. My issue is making it more high quality, equal and accessible to all Australians – at all levels (preschool, primary, secondary, tertiary) – although I feel that the biggest issues are at the preschool and secondary levels. So in choosing those four issues, I have left out two more that I feel very strongly about. Stop demonising the “other” – Australia’s political system is worse than most of the western world in its willingness (sadly from both sides, although more from the right than the left) to demonise refugees, muslims, and african immigrants. Particularly today, seeing the terrible events in Christchurch, which are at least partly the result of increasingly racist language being seen as acceptable in public life. Stop the killing of women – 63 women were killed by violence in Australia in 2018. And for each of those women killed, there are many who are damaged, physically and psychologically, by intimate partners who have nowhere to go. Supporting the funding of shelters and changing the conversation about what is acceptable could fundamentally improve those statistics. Given I gave myself only four, I’m stuck with which ones I would switch out for my next two. So I’ll let myself look at those issues also in choosing how to vote. What are your top four? Prompted by the announcement on school funding I thought I would look at the facts in my local area. I live in an area with a preponderance of schools, particularly high schools. There are 14 high schools within an easy commute of my house – eight of them within the 2km that the government says a high school student should walk before a bus pass is issued (only one of those eight and three of the 14 are comprehensive government high schools that will take all comers). The Schooling Resource Standard (SRS) is an estimate of how much total public funding a school needs to meet the educational needs of its students, as recommended by the 2011 Gonski Review of Funding for Schooling. The SRS is made up of a base amount for every primary and secondary student, along with six loadings to provide extra funding for disadvantaged students and schools. The base amount is set at $10,953 for primary students and $13,764 for secondary students in 2018. According to the Myschool website, not one of the primary or secondary government schools in my area was funded to that standard, either by state and federal government funding alone, or including the contributions by parents. My area is well above average – the ICSEA (Index of Community Socio Economic Advantage) for all of those schools is well over the average of 1,000, with an average of the schools in my sample of around 1,175). All numbers below are the most recent available, 2016 (and a larger table is shown at the bottom of this post). All of the independent private schools charged fees higher than that amount – at least 50% higher. The highest parent contribution received per pupil was for Redlands – just over $31,000 per annum. But all of them also received government recurrent funding per pupil of an average of $3,500 (Redlands received just over $3,000 per pupil). And the catholic schools? My area is interesting – it includes a couple of “traditional” parish schools, but also some very upmarket ones. All of them got a fairly close range of government funding per pupil – a range of $7,000 (St Aloysius, Kirribilli) to $9,500 (Marist College North Sydney). St Aloysius, which covers primary and high school, receives an average of just over $16,000 per pupil per year from parents. Marist receives an average of $5,500 per pupil per year from parents. In most areas of federal government spending, the Australian government has a very targeted approach. Generally, people and institutions are only funded if they need the money. But education is an exception. Very rich institutions are still funded, even if they are already receiving income multiple times the amount required to do their jobs. Some would argue that the children of rich parents who go to public schools are getting too much. Should they be contributing also? But education is a public good, a bit like roads. You don’t have to use a public road, but everyone contributes to it. That means that until we have funded the public system appropriately (which we clearly haven’t, even according to the standards set by our governments), we shouldn’t be giving extra to the private system. Writing this post, partly about my Aunt Mary, has renewed my desire to write something about the people known in my family as “The Aunts”. The Aunts, pictured above, were my father’s Aunts on his father’s side. My grandfather was the third child of eight; six girls and two boys. When he was thirteen, in 1904, his father died, leaving my great grandmother with eight children aged from 18 down to 3 and the family sheep farm. The six girls, in order, were Elsie, who at 18, was already learning to be a nurse in Whangerei (about 50 km away), Annie, 17, Lottie, 12, Myra, 11, Kathy, 9, Hilda, 7, and then there was Bill (my 13 year old grandfather) and Ian the baby, who was just 3. Of the Aunts, only one (Hilda) used the name on her birth certificate, those Scots did love a nickname! After my grandfather left school, to farm (with his Uncle Davy, his father’s brother, who I imagine at the beginning was probably managing it), all of the younger children were eventually educated in Auckland, at Auckland Grammar. That must have been a significant impost on the family finances, Lottie, Myra and Ian won scholarships, which probably helped, which is quite impressive from a one teacher school in the middle of nowhere. Myra won a maths prize after she had been there a year. After school, the younger ones all went on to get a profession of some kind. Kathy, Lottie and Myra all went to the teacher training collegee. Lottie and Kathy and Hilda married. Annie seems to have been designated companion to her mother (a family story says that Annie wanted to be a nurse too but by the time she could be spared from home she was told she was too old – a blow to her), and Elsie and Myra never married. Family report says that Myra was close to engaged to a friend of Bill’s who died on the Western Front in WW1. New Zealand lost a lot of its young men in that war – despite it being on the other side of the world, 1% of the population died, mostly young men. Once the family had been educated, they mostly left my grandfather behind on the farm and decamped to a rented house in Auckland until the big adventure (more below). I’ve been trying to piece together the story of the Elsie and Myra, later joined by Hilda, of them in their heyday and their big adventure overseas. In 1924, Myra and Elsie decided to go off to the United States. They were in their 30s, and had been working long enough to save up. Plus they each borrowed 120 pounds from a family friend (as their advance share of their inheritance from their father, which wasn’t able to be paid until two years later when the estate was finally settled), and decided to spend it on a big adventure. 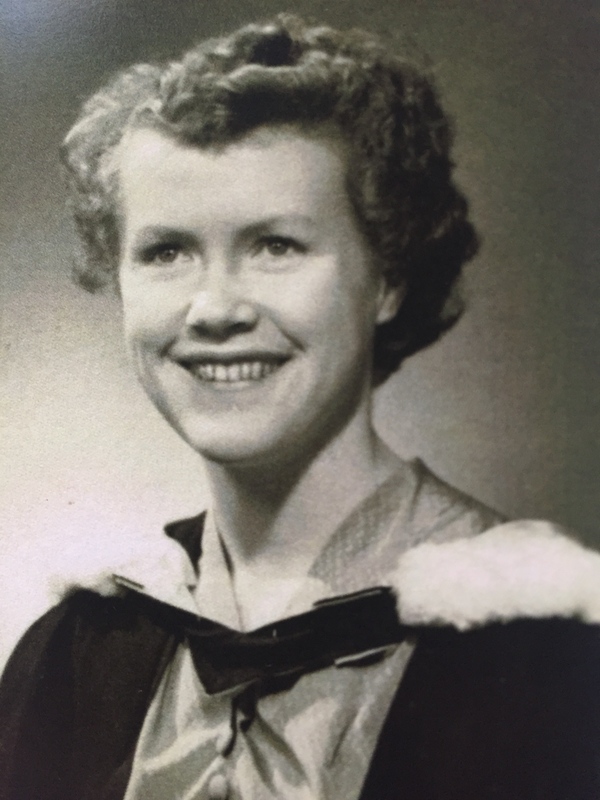 Myra was a teacher, and Elsie was a nurse (and what was then called a masseur – now a physiotherapist), and Myra was (according to family report) following a man over there. Sadly when she got there, it turned out he was already married, so they stayed for a while, working and visiting around. We have a record from the Census of Myra living in Buffalo New York in 1930. She was living in a flat, by herself (she is described as “head of house”). Elsie wasn’t with her, but they must have been in touch. After quite a while, they decided it was time to come back, and were in Chicago, ready to catch the train back to (I assume) the west coast, and find a ship to take them back. Unfortunately Elsie was run down by a taxi, and left in the street with a broken leg. Myra was so busy looking after her, trying to flag down help, that she was unable to stop someone stealing Elsie’s handbag, which soured both of them on Americans. Elsie was quite badly hurt, badly enough that Hilda (who had married, and then divorced, after losing a baby and nearly dying from complications of the pregnancy, back in New Zealand) decided to come over the New Zealand and help out. Given the only way of coming was shipping, it would have taken at best a month to get from Auckland to Chicago (probably via Fiji, Samoa and San Francisco), which hopefully meant that by the time they got there, Elsie was better and they could have fun again. They were still on their way home, so after the three of them together and Elsie was well enough, they resumed travelling, going home the long way around, via Scotland. Myra and Elsie, at least, arrived in Southampton from Quebec in 1932. They then went up to Scotland and visited some more distant relatives and the places where their ancestors had come from 100 years before. I suspect that this was how, 40 years later, there was a relative in Scotland for my parents to visit (in Plockton, near the ferry to Skye). From talking to people who knew them, Aunty Myra was the family historian. She was on the 1953 Centennial committee and in about 1951 started the work of writing to all the descendants asking for their family trees and then collating them into the six ships. This was ready for the ’53 celebrations and the original papers are held in the archive room at the museum. Her niece remembers “all of those papers, permanently spread out on the table at the southern end of the veranda, all hand written on foolscap in those days and all the letters from people. We were allowed to look but not touch or move anything. Of course Aunty Myra never so much as boiled an egg if she didn’t have to but I used to go and stay with her in Auckland when she would apartment sit for various friends and she could cope with cooking so as not to starve”. Whereas every cousin I’ve talked to remembers Hilda’s cooking – mostly the delicious cakes for visitors. Which is probably lucky given they all lived together in later life and Myra certainly wouldn’t cook much! Elsie loved purple – for clothing and her table napkin. She had beautiful white hair. And compared with her (somewhat disapproving) sisters she was very left wing. And she was also fascinating by the family history, showing relatives around the local museum and completely ignoring all the ‘do not touch’ signs at the House of Memories as she picked up exhibits and told the stories about which relative or family friend had owned them. When I first met the Aunts 50 years later, they lived in what was affectionately known (by us at least) as The Auntheap, not quite the original family house in Langs beach, pictured here around 1925. Myra, Hilda, Annie and Elsie in the mid 1960s, with their niece Donna on her wedding day. For me and all of my cousins who visited they were a fixture. I only remember meeting the adventurers – Elsie (who died in 1976), Myra (1982) and Hilda (1985). They were in their 80s by then, and I don’t remember much of them, since I spent my days at the beach if I had the choice, rather than visiting elderly relatives. There were always cakes and cats when we visited. Back ten years ago, I wrote a lot on this blog about books I had read about the history of settlement and the aboriginal experience of it in Australia. And last weekend brought me back to that reading. I spent the weekend in Richmond, by the Hawkesbury River (the Deerubbin shores, in the local Darug language) learning songs responding to aboriginal culture, and learning songs written by local aboriginal women. Richmond is a beautiful colonial town, one of the five “Macquarie towns” with many historic buildings dating back to the 1810s and 1820s. It is also very close to the location of the Secret River, a fictionalised exploration of one man’s experience, with his family, of the gradual colonisation and disposession of Australia by the British settlers. Deerubbin is the Secret River of the book, and the aboriginal women I was learning from over the weekend were descended from the people whose land was taken to build the beautiful Georgian town we were singing in. words about the vanishing of a people to make way for that beautiful Georgian architecture. Aunty Jacinta Tobin, author of the words of that Australia Day song, talked to us a lot about her vision is for all of us here in Australia to share the aboriginal history. She wrote a song for Australia Day for whitefellas to sing to be inclusive. Her words, in the most beautiful part of the song make that real. Part of sharing the aboriginal history is realising how anyone sharing in the riches of modern Australia is also sharing in the dispossession of its original people. This photo is one of my favourite photos from my family history collection. My great grandmother, the elderly lady standing third from the right, is gathered with all her descendants, by blood and marriage, on New Year’s Day 1933. There are so many great things about the photo – seeing them all dressed in their Sunday best, at the depths of the depression in New Zealand, looking at my stylish great aunts, with their flapper fashion and hats, some of whom had just come back from a big adventure travelling the US and Canada, checking out the latest in pram technology, and seeing the children who became my aunts and uncles looking cute and adorable. 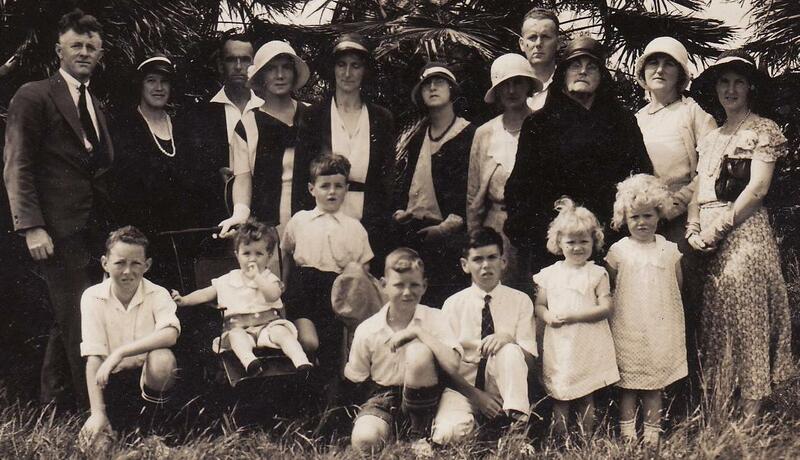 Sadly, the first death of a person in this photo was not my great grandmother, it was the child at the far left – my father’s cousin Donald, a RNZAF bomber pilot, who was killed in 1943 aged 22. This week I went to the funeral of the last survivor, my Aunt Mary, who is second from right in the front row. It was a tribal gathering, much like the one in this photo. My grandfather and grandmother are the two adults standing at the left of this photo. They had 19 grandchildren and 14 of us were at my Aunt Mary’s funeral. Knowing your family and how we are all connected is a big part of the family tradition. Being the Australian connection of a clannish New Zealand family has meant that I’ve always felt a bit separate from the main family; not in a bad way; but you can’t be as much a part of a family when you see them once every year or two if you are lucky. But coming back for what felt like the passing of an era made me remember how fortunate I am to be part of a family that really knows where it comes from. Watching the swirling conversations at the funeral, I know there are parts of the family that get on with each other better than others, it isn’t a romantic dream of perfect harmony. But everyone gets together to celebrate life and mourn its passing, and I am fortunate to be a part of that almost tribal experience. My Aunt Mary has been part of the fabric of my life; even from afar she has watched me and my brothers grow up; congratulated us at appropriate milestones, done the same for my children and she has been a source of family history when I ask my father about some particularly interesting piece of ancient gossip (particularly about his own childhood). Even though it is six years since I last saw her in person she has felt part of the world I live in my whole life. There is one almost survivor from this photo – my dad (still known as Donald Beag in some circles, little Donald, in contrast with his big cousin Donald) is hidden in utero in this picture. We were treating him a bit like porcelain this week. 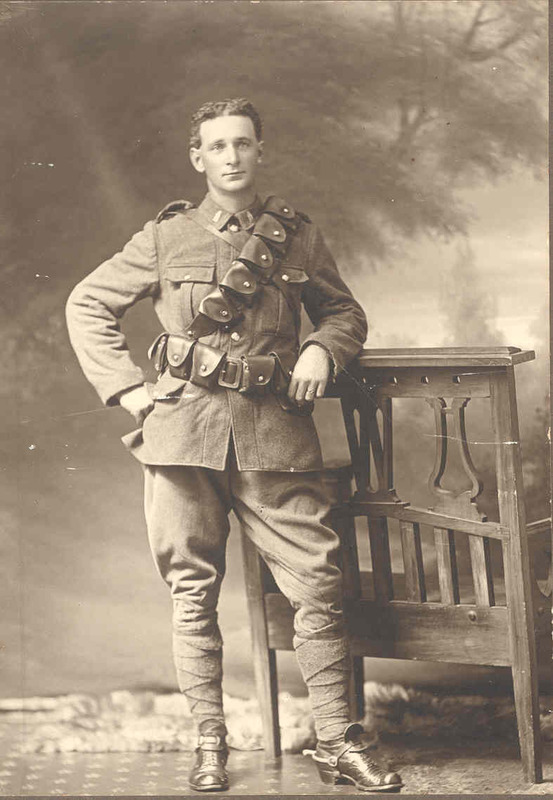 Over dinner last night, as the conversation turned to Israel, my dad started reminiscing about his father‘s first cousin – Hugh (Tui) Haswell, who was killed in 1917, in an Arab village in (then) Palestine called Ayun Kara. That village is now Rishon leZion, part of greater Tel Aviv. Dad finished up by saying that Tui had been such a part of family folklore around the family dinner table that he was astonished to find out in the 1950s that Tui was dead. According to Mexican legend, there are three types of death: The first occurs when all bodily functions cease and the soul leaves the body; the second occurs when the body is interred, returning one’s physical shell to the earth; and the final, most definitive death, occurs when no one remembers you. Tui must have been a remarkable man, to have lived so strongly in the collective memory.